Latest Update: The new Endeavour will be launched tomorrow and you can read the details here. 2019 Ford Endeavour has been spied at a Ford dealership revealing its exterior and interior. Check it out here. Ford Endeavour Facelift Launch & Price:The 2019 Ford Endeavour facelift will go on sale in India on 22 February 2019. It is expected to be priced at par with the current model, which is priced between Rs 26.83 lakh to Rs 33.31 lakh (ex-showroom Delhi). 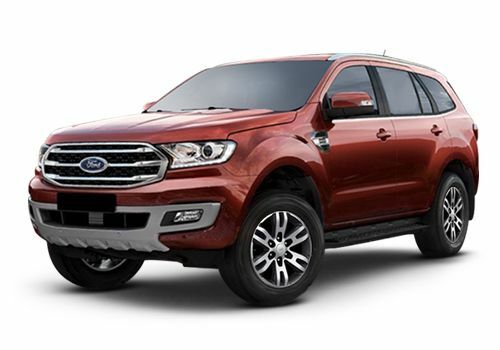 Ford Endeavour Facelift Engine: In Australia, the Endeavour facelift is available with a new 2.0-litre, 4-cylinder diesel engine in two states of tunes: 182PS/420Nm and 215PS/500Nm, mated to a 10-speed automatic transmission. However, in India, It remains to be seen whether it will continue with the 2.2-litre, 4-cylinder and 3.2-litre, 5-cylinder diesel engines, coupled to a 6-speed automatic transmission like the current model, or get the new engine-transmission setup offered in Australia. Ford Endeavour Facelift Features: On the features front, the facelifted SUV is likely to remain the same. For safety, it will continue to get 7 airbags, ABS with EBD, electronic stability program, traction control, hill launch assist, hill descent control, emergency assistance, front parking sensors, rear parking camera with sensors, TPMS, cruise control and semi-auto parallel park assist. Other features that will be carried forward include front fog lamps, HID headlamps, LED DRLs, rain-sensing wipers, panoramic sunroof, heated side mirror, powered tailgate, dual-zone climate control and a touchscreen infotainment system with Ford SYNC, Apple CarPlay and Android Auto. Ford Endeavour Facelift Competition: The updated Endeavour will take on likes of the Skoda Kodiaq, Toyota Fortuner, Isuzu MU-X and the two upcoming SUVs, the Honda CR-V and the re-badged Mahindra Rexton. Get up-to-date expert videos of Ford Endeavour 2019 - Subscribe Now! See below our handpicked Endeavour 2019 Videos from Youtube and Web. The talking point, however, is the availability of a new 2.0-litre, 4-cylinder diesel engine that will be plonked on the Australian model. It is available in two states of tune - 182PS/420Nm and 215PS/500Nm (with twin-turbo) with a new 10-speed automatic transmission. Ford currently offers a 2.2-litre, 4-cylinder and a 3.2-litre, 5-cylinder diesel unit in India which will have to be updated to meet BSVI norms, kicking in from April 2020. Both these engines come paired with a 6-speed automatic transmission. In how many colours is it going to launch? There is no official update regrading its color availability. So, we would suggtest you to wait till its launch. Will ford India offer the new black interior or they will continue with the previous colour? Ford India should offer multiple choices of interior colours. What is the expected date for its launch in India ? We are only interested to buy if u launch ecoblue 2.0 engine. This is injustice to India that u r launching new engine in the world except india..!!! !